Introduction: If there is one thing Daiwa, and especially Daiwa Japan does well, it's produce tackle worthy of our enthusiasm at the high end. Maybe not everyone appreciates the performance aspects of some of their high end product - case in point the Steez 103H/L - but when it comes to this segment of the market, Daiwa seldom disappoints. Daiwa's new-ish SS SV looks just like a Steez. The recent worldwide recession took its toll on Daiwa's high end market. As the value of the Japanese Yen (JPY) went up in relation to the US Dollar (USD), so did the relative price points of Daiwa's top end reels and soon what once was a $425 low profile baitcaster in the Steez, was now easily over $500 and closer to $550. Despite a recent normalization of the exchange rate, prices never come back down. 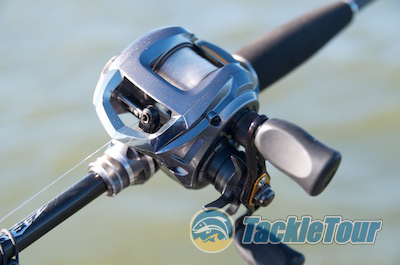 Instead, Daiwa Japan has taken a different approach by going back to the drawing board. But Daiwa Japan left some things out and got the reel's price point down. Enter the Daiwa SS SV - a reel Daiwa Japan introduced in 2014 that's essentially a stripped down Steez with a new G1 Duralumin "Air" spool, a hybrid Magnesium and Zaion frame and sideplate construction, and a newly designed "SV" rotor. A reel that, at the time of this writing can be ordered for $278 prior to shipping. Rumors have it this reel may find its way to US tackle stores following ICAST, but in the meantime, we got our hands on one straight from Japan and here now is our detailed look at the Daiwa SS SV 103H/L. Quality/Construction: Daiwa's SS SV low profile baitcasters are finished with a medium grey, metallic paint. Frame and sideplate tolerances are typical Daiwa mid to high end - spot on. 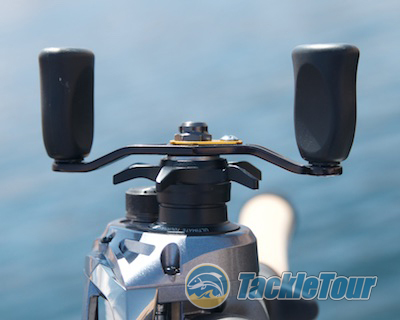 The reel's handle has zero backplay but a very small degree of movement into and away from the reel is possible at low drag settings. 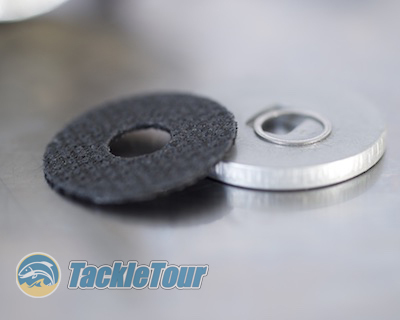 The non-bearing supported knobs also have a very small degree of play into and away from the reel. Overall this is a very nicely built reel. Performance: I spooled my Daiwa SS SV up with some 12lb Seaguar Tatsu fluorocarbon and paired it with one of my favorite all purpose rods, G.Loomis's 852C NRX. Testing grounds for this reel included Clear Lake, CA, the Delta, Lake Berryessa, and Lake Powell in Arizona. The SS SV's 80mm handle was once a standard length, but it's short by today's standards. Retrieve: The Daiwa SS SV has a feel during retrieve very similar to the Steez, but thanks to its Zaion (carbon) sideplates, it feels a tad more hollow than the Steez. The reel's 80mm handle also feels a bit short by today's standards. Otherwise, this reel has the typical smooth but connected feel we've grown accustomed to with Daiwa's magnesium framed reels. Drag: Our tested max drag for the SS SV was a shade under nine (9) pounds of pressure - not a lot, but sufficient for most applications involving those green fish with abnormally large mouths. As our Sweet Drag Performance chart shows below, the actual smoothness and consistency of the drag is good at low settings, but the closer you get to full strength, the more erratic the drag behaves on extended pulls. 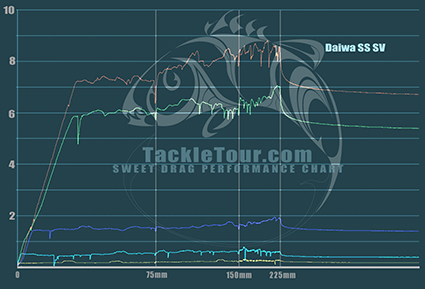 Fig 1: The Sweet Drag Performance chart above shows the consistency in drag performance of our Daiwa SS SV 103H/L. Out on the water, I noticed none of this erratic behavior, but I also did not run into any hard charging or long running fish that would go on extended runs and really test the drag. 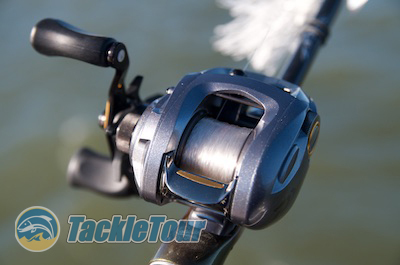 Power: The Daiwa SS SV comes in three different retrieve ratios, 7.0:1, 6.3:1, and 5.3:1. One look at those specifications and I already liked it more than the Steez because the SS SV has a low gear ratio for cranking! We tested the 6.3:1 version and found it adequate for a wide range of techniques which makes me confident the 5.3:1 will perform well as a reel for medium to deep diving cranks. The only caveat would being line capacity. The SS SV's drag stack.